Casa dei Delfini or the “House of the Dolphins”, is a beautifully restored small Venetian house, positioned off the Makrysteno, the longest narrow street in the old town of Rethymno. The house is approached through a stone archway, which leads to a tiny inner courtyard. There are two types of apartment, individually and tastefully furnished, with a simple shower/WC, hair dryer, and air conditioning and a safety deposit box (at extra local charges). A: Three studios (25sqm in size) consisting of a bed/living room with kitchenette and shower/WC, and suitable for 2 people. The studios are situated on the ground floor and on the first floor, and have a double bed or twin beds. There is one studio on the ground floor (35sqm in size) which also has a sofa bed, and is suitable for 3 people. The studios on the first floor have a tiny balcony and the studios on the ground floor have access to the courtyard. B: One maisonette on the first floor (45sqm in size), suitable for 2-4 people, with bright living/dining area with two sofa beds, a kitchenette, shower/WC and a sleeping gallery with a double bed. There is a large open roof terrace, offering lovely views of the old town and nearby mosque. The sandy beach of Rethymno is approx. 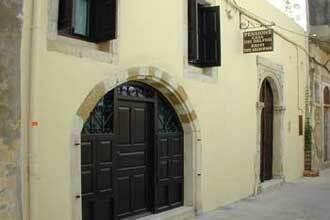 900 metres away, with tavernas, shops, cafes and other amenities all within walking distance.